MUFF WIGGLER :: View topic - 5U intelligel metropolis type sequencer..? 5U intelligel metropolis type sequencer..? anything like the metropolis sequencer in 5U..? if somehow you missed it..
Why not mount a Metropolis onto a blank 5U panel, and mount that in a 5U case? Of course, you'd have to ask Danjel van Tijn whether the Metropolis would tolerate +/-15V power or not...? Making a +-15v to +-12v converter for euro>5U conversions is pretty simple. I've built a bunch of them on protoboard, enough that I started working on a dedicated small pcb for these, but haven't finished it. Such a thing may already exist. Talk to the good Dr. Sketch-n-Etch a couple posts above, he may have a 5U version of the Dixie he can sell you? It really is a compelling sequencer. I've considered purchasing a small euro skiff just to run a Metropolis with my MU format system. this is epic.. I knew it was a roland but never seen this version or used in anger..
you build all the best modules ! Would this have MOTM-style connectors or DotCom or both? I have one of the Intellijel sequencers. It has the linear pots and most of the functions like direction, pulse, gate and stage are all digitally implemented through menu diving unlike the Roland which has stages, division and direction on the front panel switches. I don't see it as a bad thing because they are all a real quick button push and encoder twist away. Very fast access. The real difference in my opinion is that Danjel has added quite a few more features and increased things like up to 64 pulses, many more stages and has all of these things under CV control. Very very cool. The ability to desolder and replace the linear pots with rotary pots and convert the numerous digital functions to panel switches may be quite the challenge even for the highly skilled such as the FSFX crew. If it were only a challenge then it might be fun yet risky, but if it were just a matter of gaining access to one of these unique, classic sequencers then going for the 3U setup could be the most sane route. A Happy Ending Kit is all you really need. Both if I ever get around to finishing it. FreestateFX may already have something like this. I was just at the FSFX website and didn't see any power adapters there. I'm trying to sort out the whole mixed format (MOTM/Euro) thing. I thought it was just a power problem but there seems to be more to it. COTK has a DotCom +-15v to +-12v eight position adapter board plus the order of the voltages on the pins is relatively the same as eurorack. 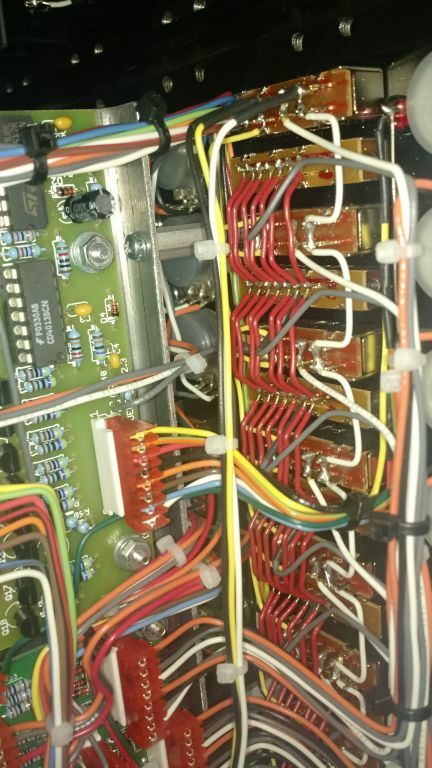 Downsides: They use 14 pin connectors instead of 16 pin like eurorack distro boards and they are keyed the opposite way. Possible solution: buy 14 pin connectors, cut off 16 pin connector from eurorack cable, attach 14 pin connector correctly orientated. Lot's of potential to accidentally do it wrong though. Mos-Lab also has a DotCom +-15v to +-12v eight position adapter board (plus a little single position one). Downsides: They use 10 pin connectors instead of 16 pin like eurorack distro boards and the wiring order isn't compatible at all so making adapter cables would be difficult. 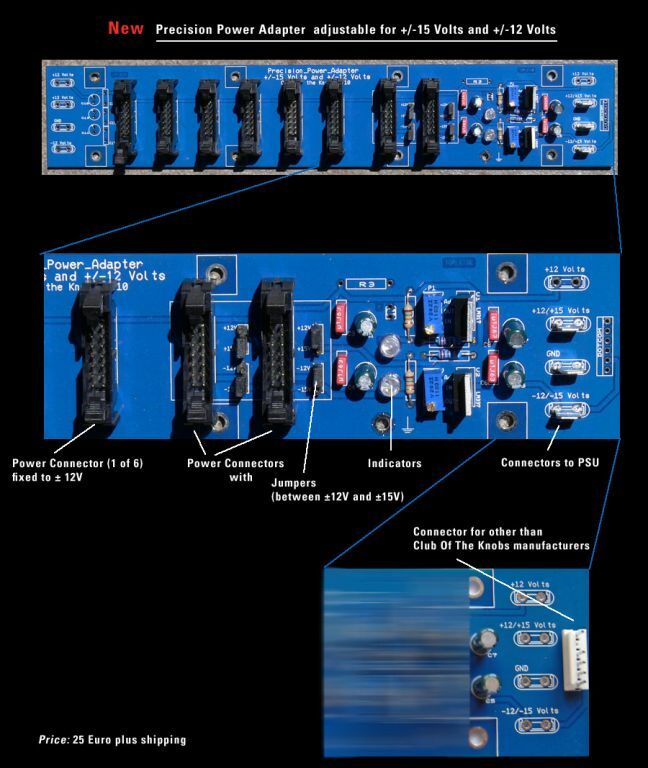 With both the COTK and Mos-Lab distros it might be possible to make a "rider" PCB to convert them to eurorack power use, like having female COTK or Mos-Lab connectors on the bottom and eurorack headers on top but, if someone went to that much trouble it would make more sense just to add a few regulators, resistors and capacitors to create a stand alone +-15v to +-12v eurorack adapter board. Downsides: It requires a 7v to 9v AC input so connecting to a DotCom supply would not be possible, or at least somewhat difficult (tapping off the transformer secondary "might' be possible if the needed voltage is present but doing so without a reasonable engineering level understanding of power supplies is asking for trouble) So, better just to use a wall wart with it. 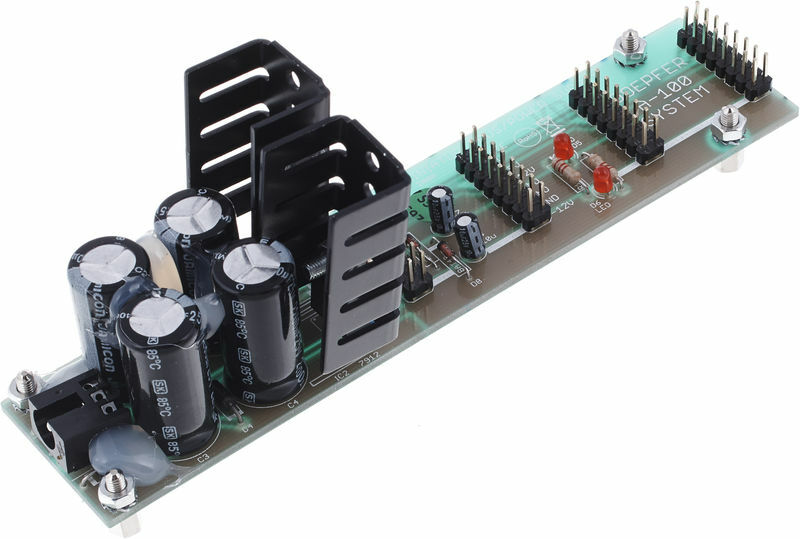 A-100SSB Small Supply/Bus for DIY applications with up to 8 modules / max. 380mA. Release date: June 2016, price about Euro 70, the picture shows the prototype without silk screen. Downsides: It needs to have a 100-240v AC connection. Mounting holes don't look like they are placed well or enough but this is a prototype picture so maybe the final version will be better? The metropolis was the sequencer that almost made me sell off my 5U system and head the euro route, really glad I didn't go all in though. The metropolis is a fantastic sequencer and while I enjoyed it while I had it the euro format just drove me crazy, I'd imagine converting it to 5U/MU would cost a ton if it was done well. I'd really like to see the Ryk M185 available again even though I've heard it was a tedious build; the feature set is just that good. I'd really like to see the Ryk M185 available again even though I've heard it was a tedious build; the feature set is just that good. Phil (Megaohm) built mine. Each of those box switches has to be handwired and routed. Edit: It's a great little machine, though, and it's a kick to play with. I suppose there was a reason that a PCB wasn't created for the box switches? You can sub in other pieces, though I'm not sure what other people used. These were a group buy when the PCB was first offered. But it's a good thing that they didn't design the PCB around them as they went out of production not too long after that. Of course everyone is formed from a different mold but I still think it is worthy of a small setup in 3U. I don't see there being any dialog issues between the formats but I definitely agree Eurorack has it's fiddly foibles. Not a real fan of the tight distances either but the original Roland design wasn't far removed from the size in 3U. BTW, when was this conversion board set offered (what year)? I totally missed that somehow. I do agree if I could get the Intellijel version in 5U it would be quite awesome. I just am not so sure I'd give up the extra features to go with a more cloned version personally. Having control over the amount of pulses, quantization scales, larger sequence length, shuffle timing as well as little detail extras in gate and trigger functions etc., are really nice. Does the 5U version shown have both skip and slew function available on the stage push buttons? I am not familiar with it at all. It wasn't a conversion board set - it was it's own little DIY pcb and chip that was offered up in very limited numbers on electro-music.com back in 2008 or 2009 or so. Completely unrelated to the Metropolis actually, which didn't exist at the time. Those unobtanium switches were part of the deal. Panels were hard to get - slots that worked for those switches are tricky - a guy named Julien in the UK made a bunch of MOTM format ones, which I have one of. It was kind of the most extreme DIY I'd done at the time - all you had was the PCB and chip, a parts list, and a schematic/wiring diagram that wasn't much help. I was totally convinced that it wasn't going to work when I first powered it up, and I even video recorded the first power up just in case, but it actually worked to my amazement! While it looks like the roland sequencer, it's actually quite different (I think, never used the real thing). It does have the switchable slew per step, and quite likely the skip feature, but these require multiple button presses to get to, and I can never remember what they are. Mine's actually been stuck with steps 1, 3 and 7 with slew on for years. Good god, I did not need to see that video. I intentionally ignore most eurorack news because I fear constant GAS. This sequencer may have finally pushed me to start a small eurorack setup to complement my 5U. Ha, pull up Mylar Melodies other video on Stepper Acid. Hope that embed works. Never tried that. bit beyond my skills at the mo i think sadly. long term dream. 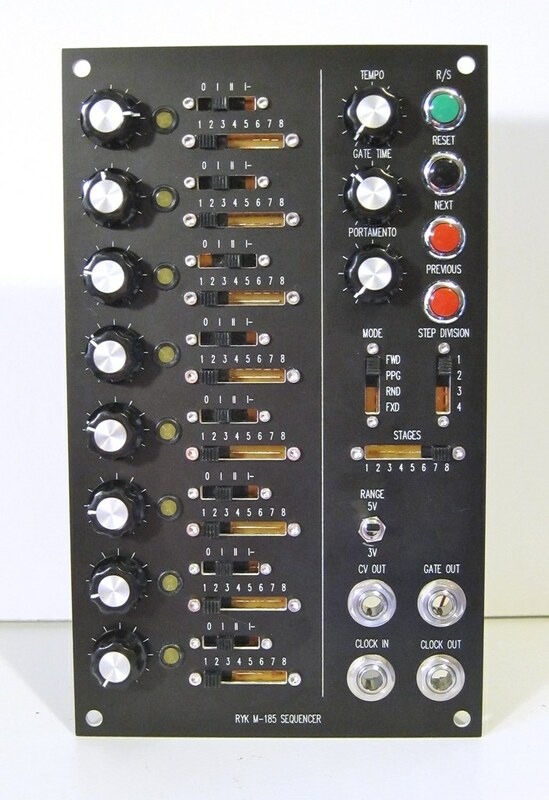 If someone knows Ryk (the inventor of this seriously wonderful module) could you please see if you might persuade him to allow others (like me - SSL) to produce them for folks that aren't DIY savvy? I would LOVE to make this sequencer available, and would love to have at least three in my rack. I would replace the unobtainium switches with slide pots though. Having looked into many sources for these switches, and without an order for over several hundred thousand units, you're just out of luck. Ryk - How about it sir? BTW it's ryktnk, not ryk. This might confuse some people, as there's also a fairly prominent DIY guy from Canada who goes by Ryk.